Besides my family, I don’t often travel with others. When I do it’s usually with Jill, whom I frequently mention in my podcasts and blog posts. She lives in Ohio and I live in North Carolina, so we ride our motorcycles to a meeting spot, then tour a region together before going our separate ways. In September 2014 we met in Brattleboro, Vermont, and went on to tour parts of New England and New Brunswick, Canada, where she taught me a valuable lesson about letting go and living in the moment. Our easternmost destination was Saint John, New Brunswick, where we pulled in at sunset, a sight I’ll never forget. There was a “Supermoon” that week, which means the moon was close to the Earth and full; it was so massive that I could have counted the craters and smelled the green cheese. As we glided into town on the bridge over the harbor on the Bay of Fundy, both the pink-purple skies and that Supermoon reflected in the bay’s still waters like a painter’s landscape. Alas, I have no pictures of it for you; by the time we reached our lodgings it was nearly dark. Speaking of which, while either of us go in for luxury accommodations very often, we adored the Homeport B&B and her owners. Ralph and Karen Holyoak cleaned out their personal garage to make room for our bikes and Ralph met us in the driveway with a flashlight to guide us in. He was born with a hospitality gene. After settling into our suite, we caught a cab downtown for a terrific meal then walked home, well after 10:00 p.m. Safe and sound. The B&B is situated on a bluff overlooking the city’s waterfront, where we witnessed sunrise from the glass-enclosed widow’s watch that next morning. Breakfast followed with some delightful fellow guests before we set off on foot for a day of exploration. Saint John is designed for pedestrians. I always felt safe, even well after dark. People there are friendly and seem to be satisfied with their lives, judging by the placid looks on their faces and the pace at which they lived their lives. I’ve never before visited a city with such courteous citizens, from retail staff to my fellow patrons at Tim Horton’s. More about that in the podcast at the top of the post. 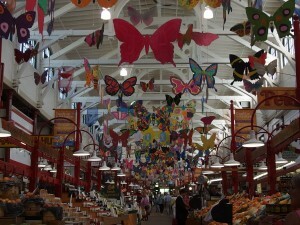 Saint John City Market is the oldest farmer’s market in Canada. The market’s roof is shaped like an inverted ship hull and there’s plenty of art and tourist kitsch to tempt you, in addition to international foods and local produce. 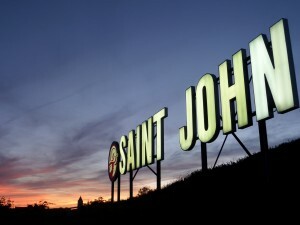 If you got a Saint John postcard from me, chances are I bought it at the market. Travel tip: Take a meal from a farmers market. Many of them offer prepared foods in addition to produce. This makes it easy for everyone in your party to grab what suits them. Then, take your food to a scenic overlook or urban perch where you can people watch. Saint John is packed with churches and historical markers, but there’s plenty of new mixed with the old. The waterfront has a beautiful walking trail that’s dotted with public art and interpretive stands. It takes you from downtown to view the changing Fundy tides at Fallsview Park. We must have walked ten miles that gorgeous September day. When you hear that the Bay of Fundy has the world’s biggest vertical tide change, you might imagine a wall of water like a tsunami coming in twice a day. Nah, that wouldn’t be the kind of place where people could build a life. To take in the enormity of the tidal change, you have to visit at both low and high tide to compare the striking difference, which can be as much as 50 feet. The Fundy tides inspired a chapter in my new book, as a matter of fact. These links help you understand the four types of tidal effects in the bay. 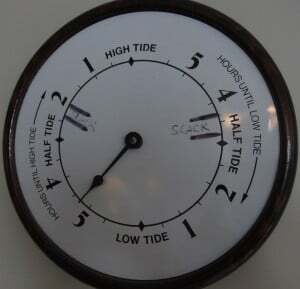 The Homeport B&B features a tidal clock for guests. Our visit came to an end much too soon. 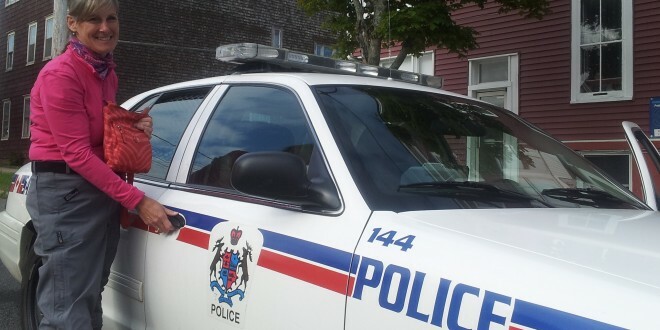 I always get a twinge of regret on the turn-back of a trip, but leaving Saint John was especially tough. I had fallen in love with her people as well as the landscape of bluffs, coves and harbors. 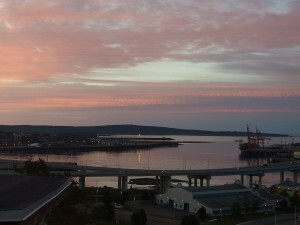 Before packing our bags, Jill and I took in the sunrise at Fort Howe, overlooking the harbor downtown. 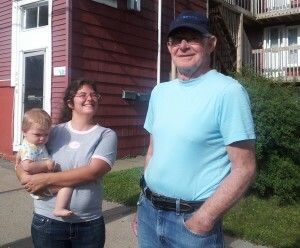 We were both eager to go on our first whale watch later that day in Saint Andrew, some 65 miles east, yet sorry we didn’t have more time in Saint John. We vowed to return, probably en route to Newfoundland and Labrador in the next year or two. In our pre-GPS days we took turns as lead rider and navigated with paper maps and Google. But for this trip I fell in behind GPS-enabled Jill and took it easy. In truth, I got a bit lazy in the navigation department as I listened to an audio book about the Roosevelts to prepare for our visit to Campobello Island and Hyde Park. More about those destinations later. On the way out of Saint John, we crossed over the Bay of Fundy on the same bridge that brought us there under the Supermoon. I noticed Jill’s head jerk toward the pavement and saw what I thought was a piece of generic gray road debris skittering in my direction. I was glad she managed to avoid it and watched as it headed my way. 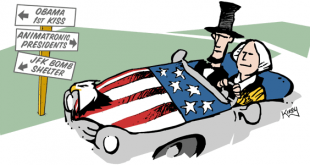 I’ve learned the hard way that bouncing road debris can lead to serious accidents. That IS her GPS, I said as I watched it continue bouncing toward the berm. I was unable to safely stop and pick it up. Saint John is a small city (population 70,000), but we were in traffic, nonetheless. We pulled over at the next exit. Jill was rightfully upset. The GPS had cost $600 and she hadn’t even received the credit card statement, much less gotten $600 in useful miles with it. I had the bright idea to call the police to see if they would take her back to the bridge and stop traffic so she could safely retrieve it. I did, not really sure I should be asking the local constabulary to get involved in a non-criminal matter, but my philosophy is if you don’t ask, the answer is “no.” The dispatcher happily obliged. While I waited for Jill to return from her recovery mission, a few residents came out to see what the “police action” was about. We chatted a bit and they went on to ask about our visit and suggested some other places we’ll have to catch when we return. Love those Canucks! Alas, the GPS was barely recognizable by the time Jill found it. The little gray box landed on the opposite side of the bridge from the direction it was headed when I last saw it. Smashed. We bowed our helmeted heads and said a prayer to shake it off. I asked Jill if she needed some time to gather herself before got back on the road, but she said she had put it behind her. She wanted to get to Saint Andrews so we didn’t miss the whale watch. What a trooper. She never brought it up again. All the great philosophies and religions teach detachment, but Jill really gets it. What a human being. The past is just a memory. The future is just an idea. Your moment of power is in the present. Seize it.